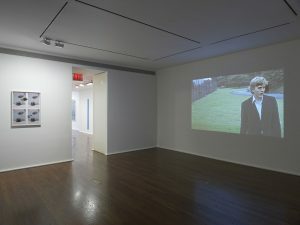 During the summer months, when many residents escape the oppressive heat of the city, New York galleries have the chance to break out of their regular programs and present group shows that often feature emerging or underrepresented artists. Last month, Hauser & Wirth organized Passing Leap, a group exhibition featuring works by Sebastian Black, John Houck, Shana Lutker, Dave McDermott, Brian O’Doherty, Barbara Probst, Sara VanDerBeek, Claudia Wieser, and Haegue Yang. Drew Sawyer caught up with the show’s organizers, Associate Directors Yuta Nakajima and Madeline Warren, before it comes down on July 31st. Drew Sawyer—What is the meaning of the exhibition title, Passing Leap, and how does it relate to the works? Madeline Warren and Yuta Nakajima—Passing Leap’ is the name of a trapeze act involving two or more acrobats maneuvering in midair. We were looking for an exhibition title that suggested some action on the part of the viewer. 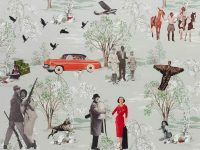 Many of the works in the show are open-ended in a playful way, and require the viewer to participate in order to fully appreciate the piece. 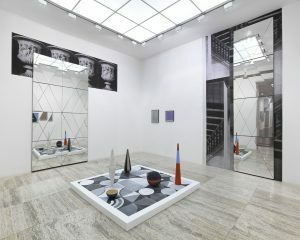 In other cases, the viewer has to physically interact with the artworks by entering an installation or moving around a sculpture to catch the optical illusion. ‘Passing Leap’ had an optimistic, kinetic and playful feel to it, which we wanted to bring these nine artists together. Drew—What was the process of selecting artists? Madeline—We try to visit studios weekly, on our Mondays off. We keep lists of artists whose work we like, and we have been following many of these artists for a few years. 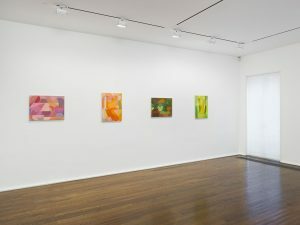 It wasn’t until this past January during a visit to LA to see John Houck and Shana Lutker that we began to detect a connecting thread – we were hiking, actually, and talking about how these artists treat the viewer almost as an audience member or participant. Yuta—Once we found this thread, we sought out other artists that could enter and enliven the conversation. 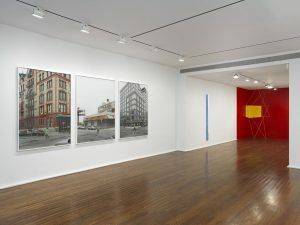 Practically speaking, we don’t have as much time to visit studios outside NY so this exhibition does tend to be a little New York-centric. Drew—How is it working as co-curators? Do you each select artists separately or do you always have a consensus? Yuta—We have known and worked together at Hauser & Wirth for close to 6 years now [Gasps]! So I would say we get along quite well. There is a back and forth about the artists, but we tend to have similar taste more often than not, which makes things easier. Madeline—We also know how to argue with one another! That push and pull has been very productive—our conversations are an editing process. 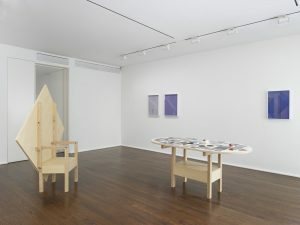 Drew—Most of the work in the show was produced in the past year or two, but you included one work by Brian O’Doherty from 1970 (along with a work from 2014). Why did you older work appeal to you both in the context of this exhibition and did you feel it was important to show the range and length of his practice? Yuta—Initially we were interested in including just a rope drawing by Brian O’Doherty. However we worked closely with Simone Subal and Prem Krishnamurthy and they suggested Meribah (1970). We had no idea that an important work of this caliber from this series was even still around, so it was a welcome surprise. Madeline—Our decision to include it had nothing to do with the date; we were thrilled to have the opportunity to show another side of O’Doherty’s practice. 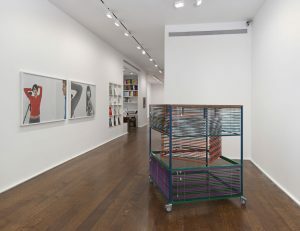 Drew—Last summer you organized a group show, Fixed Variable, on younger artists using photography which coincided with another group show on the intersection of photography and sculpture circa 1970. 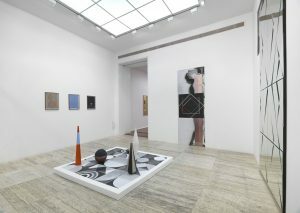 Both Fixed Variable and Passing Leap showcase artists who blur boundaries between traditional medium, such as painting, sculpture, photography, film, etc. Do you think this is a general reflection of artistic practices today? Or, what attracts you to this kind of work? Yuta—Fixed Variable was indeed about the blurring of boundaries between photography and other mediums. But that’s not something I was focused on for Passing Leap. Madeline—That being said, the multi-media practice is almost impossible to avoid at this point. Looking at Dave McDermott’s paintings, you can see how he is reconsidering the conventional idea of painting: for example, he was unsatisfied with the texture of black paint, so he resorted to adhering black yarn directly to the surface of canvas or panel. I always delight in finding what silly little pushpin or magazine cutout has made its way into one of his works – he has a way of transforming such in-the-studio objects into important moments within the composition. So, I guess I am attracted to this kind of work in which you can plainly see how an artist has experimented with a material, you catch an intimate glimpse of the decisions they have made in the studio. These artists open us up to fresh perspectives, and that in turn contributes to the conversations we have within the gallery. It’s all an education. Drew—You’ve worked with some of the artists before, such as John Houck in Fixed Variable. Obviously, Hauser & Wirth has an amazing roster of artists, so I’m curious what it means to you both to be supportive of the careers of younger artists who don’t work directly with the gallery. Madeline—It is exciting to have a chance to look closely at artistic practices that we do not already know very well. These artists open us up to fresh perspectives, and that in turn contributes to the conversations we have within the gallery. It’s all an education. 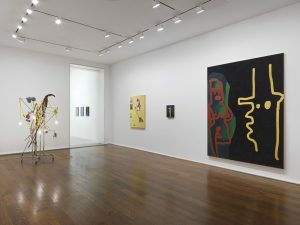 Of course, we also hope that having a show at Hauser & Wirth introduces these artists to new audiences, including curators and collectors who will continue to follow these careers. 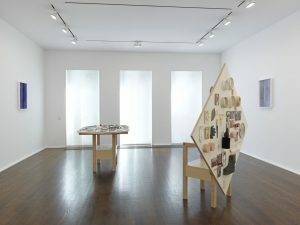 Yuta—Hauser & Wirth is a great platform for established artists like Paul McCarthy and Roni Horn, but the program also focuses on underrepresented and overlooked artists like Phyllida Barlow and, more recently, the Estate of Fausto Melotti. 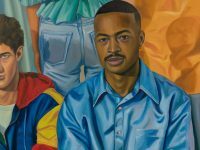 It’s exciting to be able to share this gallery and shed light on younger artists like Sebastian Black and Shana Lutker through these group exhibitions. 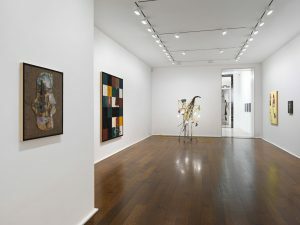 Take a last look at Passing Leap at Hauser & Wirth, 32 East 69th Street New York NY 10021, on show until 31 July 2015.